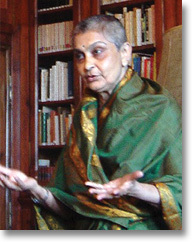 Gayatri Chakravorty Spivak is University Professor and the Director of the Institute for Comparative Literature and Society at Columbia University. B.A. English (Honors), Presidency College, Calcutta, 1959. Ph.D. Comparative Literature, Cornell University, 1967. D. Litt, University of Toronto, 1999; D. Litt, Univeristy of London, 2003. Fields: feminism, marxism, deconstruction, globalization. Books: Myself Must I Remake: The Life and Poetry of W. B. Yeats (1974), Of Grammatology (translation with critical introduction of Jacques Derrida, De la grammatologie, 1976), In Other Worlds: Essays in Cultural Politics (1987), Selected Subaltern Studies (ed., 1988), The Post-Colonial Critic: Interviews, Strategies, Dialogues (1990), Thinking Academic Freedom in Gendered Post-Coloniality (1993), Outside in the Teaching Machine (1993), Imaginary Maps (translation with critical introduction of three stories by Mahasweta Devi, 1994), The Spivak Reader (1995), Breast Stories (translation with critical introduction of three stories by Mahasweta Devi, 1997), Old Women (translation with critical introduction of two stories by Mahasweta Devi, 1999), Imperatives to Re-Imagine the Planet / Imperative zur Neuerfindung des Planeten (ed. Willi Goetschel, 1999), A Critique of Postcolonial Reason: Towards a History of the Vanishing Present (1999), Song for Kali: A Cycle (translation with introduction of Ramproshad Sen, 2000), Chotti Munda and His Arrow (translation with critical introduction of a novel by Mahasweta Devi, 2002), Death of a Discipline (2003), Other Asias (2005), Red Thread (forthcoming). Significant articles: "Subaltern Studies: Deconstructing Historiography" (1985), "Three Women's Texts and a Critique of Imperialism" (1985), "Can the Subaltern Speak?" (1988), "The Politics of Translation" (1992), "Moving Devi" (1999), "Righting Wrongs" (2003), "Ethics and Politics in Tagore, Coetzee, and Certain Scenes of Teaching" (2004), "Translating into English" (2005).